We often discuss the difficulties and concerns facing those who are trying to care for loved ones from a distance. They are the children who moved out of state following spouses, careers or dreams; the nieces and nephews who moved for higher education; and the old friends from adolescence who live back in childhood homes. From miles away, they can manage finances, keep the disposition of loved ones up and check in with phone calls, but long-distance caregivers are unable to manage day-to-day responsibilities such as grocery shopping, cooking, cleaning or transportation. Most substantially, a long-distance caregiver may struggle to keep an eye on a loved one without the help of technology or friendly neighbors. The working caregiver is struggling to manage a nine-to-five job while ensuring an elderly loved one is receiving proper care. As the children or siblings, they often don’t identify themselves as caregivers and therefore don’t look for outside resources. They face the difficult task of balancing caregiving and work obligations, without also sacrificing time from other responsibilities. Working caregivers are giving up more than time to provide the level of care their loved ones need – there are many hidden costs associated with home caregiving. Nonetheless, their loved one probably requires in-person tasks, too, such as assistance walking from room to room without falling or company to prevent the onset of social isolation. Originally defined in the 1980s as younger women in their 30s-40s responsible for both elder and childcare, the sandwich generation has evolved. Today, the sandwich generation is made up of men and women, still caught between taking care of their own children and looking after their aging parents, in addition to maintaining careers. The people stepping into this role are currently the children of baby boomers, also known as Generation Y, or the “Baby Boomer Echo.” With the increased life expectancy of the 21st century, we are also seeing this generation refer to those with young children, aging parents and elderly grandparents. Acting as multigenerational caregivers, today’s sandwich generation is prone to high levels of stress. They can’t find enough time in the day to accomplish the multitude of responsibilities they’re facing – or afford them all. Driving to and from doctor’s appointments and soccer practice, grocery shopping, feeding two or more separate families and giving everyone enough love and affection can be draining. If one’s life is impacted by the health of a partner, they are defined as a spousal caregiver. This causes a switch from the intimate confines of their relationship to that of caregiver and patient, a role change that can be hard to adjust to and is often difficult to manage. The idiosyncrasies, habits and preferences learned over the years make the spouse a prime candidate for providing comfortable, personal care, but pose many problems for the caregiving spouse. An immense amount of stress likely overcomes the spousal caregiver. As they often live with the person they are caring for, there is little time for any breaks physically or emotionally. Approximately 80% of today’s in-home care is provided by unpaid caregivers, namely family and friends. While loved ones respectfully step up to care for America’s elderly, it can place an unknown burden on everyone. 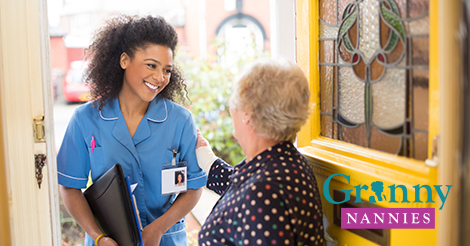 Lean on the Certified Nursing Assistants (CNAs) and Home Health Aides (HHAs) at Granny NANNIES, a home health care agency dedicated to ensuring patients and their loved ones receive the home care they require and deserve. Granny NANNIES works exclusively with verified caregivers, who display the medical knowledge, kindness and compassion needed to care for others necessitating long-term care for diseases such as Alzheimer’s and Parkinson’s or short-term, temporary respite relief. Granny NANNIES has been providing specialized home care services for the elderly since 1990. Our services can be personalized to meet any home care requirements and are available 24 hours a day, 7 days a week. Located in 35 cities across 10 states, you and your loved one will be treated with the highest level of respect and dignity. For quality, trustworthy, reliable and affordable senior care, call 800-316-2669.